^ Von Wielligh, Nic; Von Wielligh-Steyn, Lydia (2015). The Bomb – South Africa’s Nuclear Weapons Programme. Pretoria, ZA: Litera. ISBN 9781920188481. OCLC 930598649. ^ a b Hersh 1991, p. 271. ^ a b Rhodes 2011, pp. 164–69. ^ a b Weiss 2011. ^ a b "PressTV-'Israel, S Africa conducted nuclear test in 1979'". ^ a b c "Declassified documents indicate Israel and South Africa conducted nuclear test in 1979". ^ Albright 1994, p. 42. ^ a b Ruina 1980. ^ a b c Richelson 2006. ^ Lewiston Morning Tribune 1979, p. 25. ^ "The Vela Incident: Nuclear Test or Meteorite?". Retrieved 2017-04-19. ^ a b Barnaby 1989, p. 17. ^ Polakow-Suransky 2010, p. 139. ^ a b c d Gilinsky 2004. ^ "U.S. Monitors Signs of Atom Explosion Near South Africa". 26 October 1979. ^ National Security Council 1979, p. 2. ^ "Interagency Intelligence Memorandum "The 22 September 1979 Event"" (PDF). Central Intelligence Agency. January 25, 1980. p. 11. Retrieved 28 July 2017. ^ a b Weiss 2011, p. 3. ^ Cohen, Abner; Burr, William (2016-12-08). "What the U.S. Government Really Thought of Israel's Apparent 1979 Nuclear Test". Politico. ^ Ruina 1980, p. 9. ^ Ruina 1980, pp. 14–16, 18–19. ^ Ruina 1980, pp. 9–11. ^ Ruina 1980, p. 19. ^ Richelson 2007, p. 289. ^ a b Los Alamos National Laboratory – 1997. ^ a b Weiss 2011, p. 4. ^ a b c Richelson 2007, p. 296. ^ Broad 2008, p. 2. ^ Albright 1992, p. 42. ^ a b Jimmy Carter, White House Diary (Norton and Co., 2010), p. 405. ^ "Treaty Banning Nuclear Weapon Tests in the Atmosphere, in Outer Space and Under Water". United States Department of State. ^ Clarke 1979, p. 11. ^ Richelson 2007, p. 419. ^ "One hell of a gamble by Aleksandr Fursenko and Timothy Naftali" p. 132. ^ Richelson 2007, § 7: The Double Flash. ^ Wilson Center Digital Archive. "Interagency Intelligence Memorandum, US Director of Central Intelligence, NI IIM 79-10028, 'The 22 September 1979 Event' [2013 Release]". Retrieved March 23, 2016. ^ a b National Intelligence Council 1985. ^ Hones, Baker & Feldman 1981. ^ a b Albright 1997. 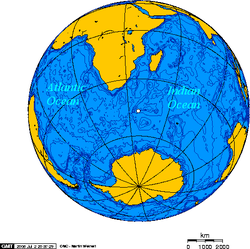 ^ a b c Vela Incident: South Atlantic Mystery Flash in September 1979 Raised Questions about Nuclear Test National Security Archive Electronic Briefing Book No. 570 (December 8, 2016) Edited by William Burr and Avner Cohen. Retrieved December 8, 2016. ^ "PressTV-'Israel, S Africa conducted nuclear test in 1979'". ^ Ariel, Abe. The last war, Collins Australia, 1988, ISBN 0-7322-2416-0, ISBN 978-0-7322-2416-5. Albright, David (July–August 1994). "South Africa and the Affordable Bomb (inset: The Flash in the Atlantic)". Bulletin of Atomic Scientists. Albright, David; Gay, Corey (November–December 1997). "Proliferation: A flash from the past". Bulletin of Atomic Scientists. Archived from the original on 17 March 2005. Retrieved 30 March 2010. Amato, Ivan (2001). "Pushing the Horizon" (PDF). Naval Research Laboratory. Retrieved 16 January 2012. Barnaby, Frank (1989). The Invisible Bomb: The Nuclear Arms Race in the Middle East. I.B. Tauris & Co. Ltd. ISBN 1-85043-078-0. Bartoli, Yvonne (7 October 1999). Comprehensive Test Ban Treaty Cannot Be Verified (PDF) (Report). United States Senate. Archived from the original (PDF) on 31 January 2008. Broad, William J. (8 December 2008). "Hidden Travels of the Atomic Bomb". The New York Times. Retrieved 15 January 2012. Clarke, Bruce C. (December 1979). "The 22 September 1979 Event" (PDF). Interagency Intelligence Memorandum. National Security Archive. MORI DocID: 1108245. Retrieved 1 November 2006. Dodson, Christine (7 January 1980). Discussion Paper for Mini‑SCC (PDF) (Report). Washington, D.C.: National Security Council. Gilinsky, Victor (13 May 2004). "Israel's Bomb". The New York Review of Books. Retrieved 8 December 2007. Hersh, Seymour (1991). The Samson option: Israel's Nuclear Arsenal and American Foreign Policy. Random House. ISBN 0-394-57006-5. Hones, E. W.; Baker, D. N.; Feldman, W. C. (April 1981). "LA‑8672: Evaluation of Some Geophysical Events on 22 September 1979" (PDF). Los Alamos Scientific Laboratory. Pike, John. "Nuclear Weapons Testing – Israel". GlobalSecurity.org. Retrieved 19 September 2010. Polakow-Suransky, Sasha (2010). The Unspoken Alliance: Israel's Secret Relationship with Apartheid South Africa. Jacana Media. ISBN 1-77009-840-2. Rhodes, Richard (2011). Twilight of the Bombs: Recent Challenges, New Dangers, and the Prospects for a World Without Nuclear Weapons. Random House. ISBN 0-307-38741-0. Richelson, Jeffrey (5 May 2006). "The Vela Incident: Nuclear Test or Meteoroid?". National Security Archive. Retrieved 25 August 2008. Richelson, Jeffrey T. (2007). Spying on the Bomb: American Nuclear Intelligence from Nazi Germany to Iran and North Korea. W. W. Norton Co. ISBN 0-393-32982-8. Ruina, Jack (23 May 1980). Ad hoc Panel Report on the September 22 Event (PDF) (Report). Released by FOIA request, Frank Ruina, chair, 23 May 1980. Turnam, B. N. (September 1977). "Detection of Lightning Superbolts". Journal of Geophysical Research. 82 (1): 2566–68. Bibcode:1977JGR....82.2566T. doi:10.1029/jc082i018p02566. Weiss, Leonard (30 July 2011). "The 1979 South Atlantic Flash: The Case for an Israeli Nuclear Test" (PDF). Stanford University. Retrieved 17 April 2012. Weiss, Leonard (2011). "Israel's 1979 Nuclear Test and the U.S. Cover-Up" (PDF). Middle East Policy Journal. 18 (4). Archived from the original (PDF) on 6 June 2014. "Blast from the past: Los Alamos Scientists Receive Vindication". Los Alamos National Laboratory. 11 July 1997. Archived from the original on 1 August 2012. Retrieved 25 June 2009. "Volume 1: History of the Air Force Technical Applications Centre" (PDF). Patrick Air Force Base, Florida: United States Airforce via National Security Archive. 17 May 1982. Retrieved 25 August 2008. "Prospects for Further Proliferation of Nuclear Weapons" (PDF). Special National Intelligence Estimate. CIA. 23 August 1974. SNIE 4-1-74. Retrieved 20 January 2008. "Memo: South Atlantic Nuclear Event" (PDF). Washington, D.C.: National Security Council. 22 October 1979. Archived from the original (PDF) on 9 July 2011. Trends in South Africa's Nuclear Security Policies and Programs (PDF) (Report). CIA. 5 October 1984. Retrieved 16 January 2012. 国家情報会議 (September 1985). "The Dynamics of Nuclear Proliferation: Balance of Incentives and Constraints" (PDF). CIA. NIC M85-10001. "UNSCR 418 of 4 November 1977". United Nations Security Council. "Sonic Boom Caused By Lightning In Storm, Canada Police Say". Toledo Blade. 3 April 1978. Retrieved 23 July 2010. Burton, Myra F.; Howard, Adam M., eds. (2016). Foreign Relations of the United States, 1977-1980 (PDF). history.state.gov. XVI (Southern Africa). Washington, DC: Department of State, Office of the Historian, Bureau of Public Affairs. pp. 1086–1114. Retrieved 9 September 2016. Marshall, Eliot (30 November 1979). "Flash Not Missed by Vela Still Veiled in Mist". Science. 206: 1051–52. doi:10.1126/science.206.4422.1051. Marshall, Eliot (1 February 1980). "Scientists Fail to Solve Vela Mystery". Science. 207: 504–06. doi:10.1126/science.207.4430.504. PMID 17795621. Marshall, Eliot (29 August 1980). "Navy Lab Concludes the Vela Saw a Bomb". Science. 209: 996–97. doi:10.1126/science.209.4460.996. PMID 17747218. Press, Frank (16 January 1981). "Science and Technology in the White House, 1977 to 1980: Part 2". Science. 211: 249–56. doi:10.1126/science.211.4479.249. PMID 17748010. Torrey, Lee (24 July 1980). "Is South Africa a nuclear power?". New Scientist. 87 (1211): 268. ISSN 0262-4079. OCLC 2378350. Retrieved 9 September 2016. Weiss, Leonard (8 September 2015). "Flash from the past: Why an apparent Israeli nuclear test in 1979 matters today"". Bulletin of the Atomic Scientists. Retrieved 9 September 2016.